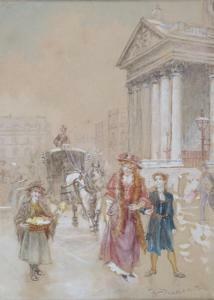 Find artworks, auction results, sale prices and pictures of Walter Duncan at auctions worldwide. 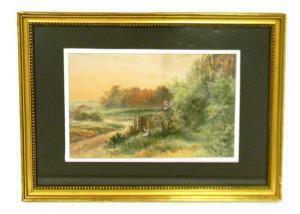 Walter Duncan - British Artist 1848 - 1932 Pair of Small Watercolours. Titled - Near The Thames River ' Hay Gatherers Summers Day. 7 x 5 Inches. Mounted and Framed Behind Glass. 2/ Summers Day - Thames River, Figures on a Boat In The River, with Large House In Distance on Banks of River. 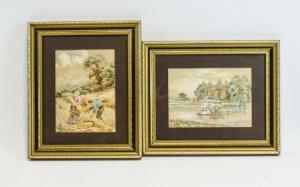 Both Paintings Signed W. Duncan and Dated 1906. 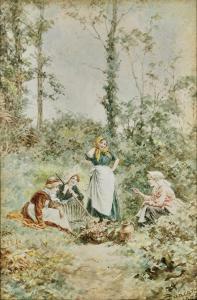 Walter Duncan (British, 1848-1932), graphite and watercolor on paper depicting woman picking blueberries and young girl playing with flowers near picket fence in late summer landscape, signed "W. Duncan" LR, isolated repair to modern gilt frame LR, matted and framed behind glass, not examined out of frame, ss: 8" h. x 12 1/2" w.
Once you have saved a lot as a Favourite, it will show below.